John Hunt Publishing, 2012, 183 p.
I nestled myself in the corner of my couch, warming my hands on a cup of tea and opened ‘A Druid’s Tale’ expecting a chronological story about how Cat Treadwell discovered Druidry. I was eager to read about her life up until now and curious who she met and what she picked up along the way so with great anticipation I started reading. After the first few pages, filled with raving reviews and loving words, Cat starts to explain why she wrote this book. How things came together and what she wants to tell the world. A lot of initial “why’s” get explained pretty soon and after a few pages you can almost hear her speak to you. Sitting across the room, with a cup of tea between her hands, chatting away about her views on different subjects. Sometimes drifting a little from the topic, but always smiling and with a positive attitude. It is clear that she wrote this book coming from a very loving place and it is obvious she isn’t afraid to share her points of view. Obviously her perspective isn’t the only one and Cat makes it clear that this is her way of doing things and not per se the right or the wrong way. Just, her way. 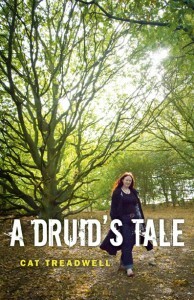 The book is filled with contemplations, memories, funny moments and serious reflections about Druidry. Whilst my brain soaks up the words, my heart starts to understand where she is coming from. The ‘why’s’ are answered and along the way I get a lot of food for thought to reflect on my own path up until here. I think I lot of people will enjoy reading this book since it is a nice collection of answers on how Cat Treadwell sees the world and the folk living in it. The book won’t give the answers on when to celebrate certain feasts, or what colour candle to light in what direction. However, her story will give you the opportunity to take a step back and think about what you believe and why. Be it Pagan, Wiccan, Druid or Christian, I think most people can find a few valuable lessons in this compact, easy to read book. I recommend it to anyone who wants a chat with a newly met friend, holding a cup of tea between your hands! Witch by birth, student by choice. Born into the loving arms of Merlin and Morgana as a little witch, now 30 and a person of her own. She took on the task of protecting the heritage of Merlin when he passed on. Rhianne is a big lover of animals, people, music, books and jummy food.